"It all starts with ​the plans"
We design your extension in line with your requirements, we can advise and suggest design ideas and solutions. With planning laws relaxed your extension can allow more flexibility with your design. 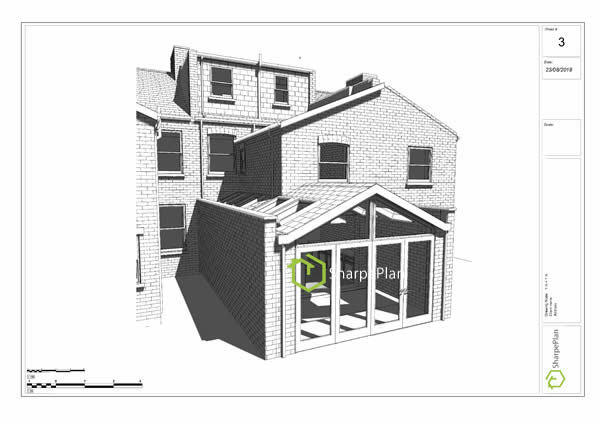 With our full design packages we will submit both your planning and building control applications, we include structural steel / timber calculations in prices quoted. ​Just click on the image below and move to rotate 9 out of 10 clients find this addo service invaluble and has alowed them to make great design choices. It is important to know what you can build on your site before you decide what you want to build. Some properties will be allowed to build a two storey rear extension under permitted development law. 2. Your design, concept, brief. Once you know what you can build the design work can begin. Space separation and uses, light and interior design, are all things to be considered. This may sound complicated or seem more trouble than it’s worth but a well-designed extension will make the difference between an extension that works well and one that doesn't. We will cover the above and concepts to assist your design maximise your space on our site survey. 3. What will you be using your new space for? Your extension will generally require one of the following approvals, Permitted development or Full planning permission. If you are proposing to use the extension for habitable purposes you will also be required to gain building control approval. Clarification so that's two separate applications to two different departments at your local council, one to the planning department and one for building control department. Both interested in different aspects of your proposed extension. The planning department will generally be looking at the external appearance and design, whilst building control will be looking at the structure and ensuring standard are met. structural calculations for all steels, footings, rafters, columns, retaining walls all unique to your property. Strict pricing quotations specifically for your project requirement, we believe this is the only way for our clients to receive true value for money without paying for services they don't require. We submit your applications to local council and deal with any revisions that may be requested consulting you all the way absolutely free of charge. This means that the form you fill out to receive your quotation is the only form you will be required to fill out. We provide full planning and building regulation plans for you house extension we offer competitive rates without compromise on a professional service. ​If you are happy with your quotation just reply that you would like to go ahead and we will allocate you with an onsite consultation, survey and get your project started.